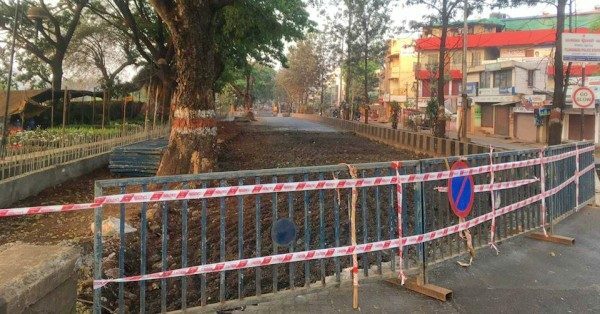 Congress road from Nanawadi cross towards the First gate has been closed for white topping (concrete). All the intersections have also been blocked. Now two-way traffic from one side and this could take 30 days or more to complete. Rs. 37.96 Crore will be spent on the white topping for Congress road. The white topping is the covering of existing asphalt pavement with a layer of Portland cement concrete. The white topping is divided into types depending on the thickness of the concrete layer and whether the layer is bonded to the asphalt substrate. White topping roads have a design life of 15-20 years. Roads designed with white topping do not require maintenance for 15 years. Meanwhile, white topping roads along with provisions of footpath, shoulders, stormwater drain with proper chamber correction and all other utility duct are sustainable. These have a long life, low-maintenance, low life-cycle cost, with improved safety and environmental benefits. After the Concrete is put, it would take around 28 days for curing.